This question came up as a comment to one of my posts as I keep referring back to 80s and the good practices followed with respect to home cooking. Whoever asked this, thanks. It’s an interesting question that got me thinking. First of all, avoiding junk and eating healthy, home cooked food is definitely NOT the ONLY contributor to good health, though it plays an important role. There are so many other factors that need to be considered - physical activity, exercise, emotional wellbeing, keeping one’s mind active and engaged, environmental factors such as air we breathe, water we drink etc. Speaking from my experience, if I am stressed about something, then the negative effects of that stress outweighs all my other regular healthy habits like eating home cooked food, avoiding junk, doing Yoga etc. Emotional wellbeing plays such a significant role in our health. Going back to the question, I consider 80s to be a sandwich decade and 90s to be the decade of change post liberalisation. TV entered Indian households in the 80s with just Doordarshan (DD1 and DD2) with limited timings. There weren’t 24-hr back-to-back programmes back then. I remember the TV will be switched on around 7PM and we would watch News, Chitrahaar, Oliyum OLiyum etc for max 1 - 1.5 hours. Same timing applied for my parents and grandparents too. The concept of sedentary lifestyle didn’t exist back then. Every adult in the family was extremely busy with some physical work or the other. Come 90s, slowly things started changing, with “cable TV” entering our households. The endless serials and choices of channels reduced our physical movement and activity. Because of liberalisation, new junk foods got introduced. Bread, jam, margarine, biscuits etc became easily available. Refined oils became the norm and cold-pressed oil mills shut shop. Handpounded rice gave way to silky, polished white rice which most of us grew up eating. The practice of cooking with millets was totally lost, except for the occasional “kevurumaavu dosai” (ragi dosa) that would be made at grandma’s home. Plastic entered our homes from all directions. That’s the same time when the number of people with diabetes and blood pressure started increasing, especially among people with higher disposable income. I remember an article I read in the 90s that spoke about how diabetes is a disease that targets the rich (panakkaarargaLukku varum vyaadhi). Who were considered “rich" back then - people who can afford cable TV and can afford the time to sit and watch through all serials, people who can afford househelp and delegate the household chores, people who can go out to restaurants, buy packaged food, get imported chocolates from cousins visiting from abroad etc. Because of increased disposable incomes and easy availability of many “conveniences” at affordable pricing, the number of people falling into this “rich” bracket kept increasing in the 90s and 2000s. These above conclusions are based SOLELY on my observations and may not bear any statistical significance. 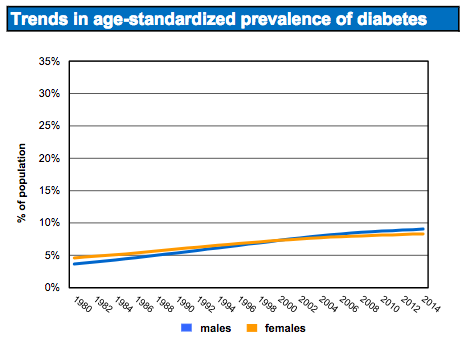 Based on the data from WHO, as you can see, the sharp increase in diabetes incidence started from the 90s and the numbers are only getting worse as years pass by. Long story short, irrespective of the decade you were born or grew up in, I believe all of us need to consciously focus on these 5 areas for our good health. 1. Eat home cooked, local foods. Avoid all packaged, junk foods. 2. Do some form of exercise that interests you and pushes you a little bit everyday. 4. Look after your emotional wellbeing. Avoid stress in all forms. Stay engaged in any activity of your interest. Get a good night's sleep for 7-8 hours. 5. Do your best to protect our planet. The health of the planet impacts your health.